I work in the school's clinic and my morning duty is breakfast. I get to watch all the kids at breakfast, making sure they get along (the most trouble I have is between siblings). I have to encourage them to eat so they can get to class in time. I also help them in line and make sure they get their spoons, napkins and straws. If they spill something I show them how to clean it up,( apparently they never do this at home). You should see the look I get when they spill! Here are some of my breakfast buddies. It was hat day, so this is the only time I let them wear hats inside. Since I am in and around the kitchen at breakfast time I see what goes on when they are prepping for lunch. Now in light of Jaimie Oliver's Food Revolution I noticed how much fresh vegetables we do get and use in our school. We also have not had whole milk for some time now. I heard that we are one of the first countys in the state to implement this, we are ahead of the rest. So when I heard him say we need more fresh foods, I was confused. The manager of the kitchen said they work with nutrition and the state guideline and they change the menu all the time, to make sure it works. If the kids won't eat it they have to take it off the menu. If they don't buy lunches, the kitchen looses workers, etc... They work hard at making in nutritious and what the kids will eat. The school menu provides a nutritional guideline, green = the best choice, yellow = the next, and red = the most choice you have to watch out for. In the morning walking through the kitchen I often see fresh veggies. This zucchini has just been sliced and will go in the oven to steam for lunch. Fresh lettuce and veggies go into the salad choice daily. Fresh topping for the turkey sandwich choice for those who do not want salad or spaghetti today. I was there for breakfast, so I thought I'd show you a taste of breakfast. Scrambled eggs and grits, toast (often whole wheat). Or they can always get cereal (often less sugar). They always get a fruit or juice. Here is the school lunch today. Let's take a look at what some mom's packed for their child's lunch. Here's one, the wrap looks good. hmm..not bad, sandwich, and she has yogurt in there. Yes, some pasta, and good, fresh fruit! But wait...more to come. oh yes, cookies, cheese nips, gummy snack, and that's red licorice under that. Not sure what the bar is. This was just a smattering of lunches that I saw briefly as I was walking to the teacher's lunch room. I've always been surprised on what kids bring for lunch. My daughter's lunch. She has always been a good eater, and usually has whole wheat bread, she still likes her sandwiches, (no mayo). I got this bread from the Italian bakery by us. She never did like school lunches. I'm not saying that our school lunches don't need any changes, I think they should do away with the chocolate and strawberry milk, even though they are 1% fat. Have you ever seen chocolate milk on Cinnamon Toast Crunch? It's not a pretty sight. I also think good nutrition and good choices start at home. I've always wanted to see what the other kids bring for school lunch. My kid catches the devil because some of the foods he eats the other kids have never seen before. I really enjoy reading this post, nice to see all these healthy lunch boxes, give me some idea to prepare for my kids later. Thanks for sharing these photos and have a great weekend ahead. Good for you for making sure that your daughter isn't eating junk. I love the cucumbers cut out with the flower shapes--genius. Breakfast? Are we supplying breakfasts now for kids? I hadn't heard that. I am really out of the loop. They actually come to school without having had breakfast? That makes me very sad. Amazing that the kids would actually eat zucchini! Salad yes, but steamed zucchini is truly tasteless. Keep these posts coming...I am sitting here in amazement! Wow!! You cook for a school!! You're right, fruits and vegetabels are very important!! The children bring quite alot of food to school. I think our local school canteen selling too many tibits! One good thing about our school here was they're not allow to sell soft drinks. My children don't eat much at school. They normally bring their own food like bread and then come home to take their lunch at 1.30pm. Thanks so much for sharing such a wonderful post. Have a fabulous weekend, Lynd! My kids are homeschooled now but when they were in school, they mostly brought their lunch, I let them pick about 3 or 4 days a month for their favorites. Nice to see that your school is attempting healthier things though. I hope more follow! It is fun being with the kids at breakfast. I did get the parents permission to post the ones I have with their faces. I have seen some bring in sushi, or some other different food items. I just stopped at one table to take a few snaps for the post. We have around 800 students at our school. Lunches go from 10:50 to 12:41. At 15 large tables. It was so interesting to see what they pack, from junk food to great food. I can always give you some good ideas for your kids lunch when you need it. Let me know! Thanks, I have always tried to feed her healthy and it shows in what she eats now. She never liked sandwiches until she was older. It was a challenge to figure out what to pack her. Ever since I've been with the school system(10years)they've had breakfast. It was new to me too. The breakfast is before school starts and it's not just for free and reduced lunch kids. Some parents that need to go to work will drop them off. Kids can come and eat breakfast or not. We get about 150 in and out at breakfast. Gosh I guess kids have come a long way from the peanut butter and jelly that I used to get! No I don't cook the food, I just monitor the children while they are eating breakfast. I think it's funny how some kids love school lunches and some don't. You're a good mom for doing it the way you do, still monitoring what she eats. They don't allow soft drinks in elementary schools here either. If a parent sends it in their lunch or even send it for them at breakfast(it's happened)I won't let them drink it. The sizes are all over the place. They still have some work to do, and give the kids too many chances not to eat their vegetables. But they do bake everything and don't have any fryers. I remember in Taiwan, school also cook healthy food for students, of course parents need to pay a small sum of money for the food or some parents prefer to make bentos for their kids to bring to school. Teaching the next generation proper nutritional habits is of paramount importance. Fruits and vegetables must be the cornerstone. Move them away from sugar and high fat content. Lyndsey, I am impressed with the food and the children's manners. Manners are so important, but frequently overlooked in today's world. It's fabulous what Jamie Oliver is doing and I also wish our first lady well in her endeavors to make sure kids eat healthy. I always think of school lunches as "ick" but compared to what so many kids bring the school lunches are an excellent option. My kids are like your daughter, they prefer to take lunch most days and I'm proud to say it's generally healthier than our school lunch options! Love the lunch you fixed for your dtr...will fix my kids lunches?? What a wonderful post! Supporting healthy, vibrant, seasonal food is a really important part of kids education (and adults, too)--wonderful photos...I love how you approach food and food culture from such a open and generous point of view! You know as a lunch lady on the other side of the continent, I LOVE this post! We have fresh salad and fresh fruit every lunch and stick to the state guide lines as well but there is a lot of room for improvement. My school is actually going through some MAJOR changes. We have been picked up buy a healthy school initive and we are going to all ome made, organic, local foods. Goodbye packages burritos and pizza. It's gonna all be homemade. My school is a free lunch and breakfast)school so it will be interesting to see how all the changes affect everything. I see you guys use reuable trays? That is one of my biggest pet peves is all the styrafoam trays we use. about 500 a day. That will change! But we have the garden up and running and lots of fruit trees planted. It will be exciting to watch the plan unfold. Thanks for letting me peek into your school cafeteria! It was a fun post!!! I loved this post ! Great to see all the sweet kids, too :) I agree with you 100% that good eating habits start at home. My daughter gets NO junk/processed stuff in her lunchbox, and eats very little of it at home, either ... my (adult) friends are amazed that she eats raw peppers, cucumber and bean sprouts ... I say, well it's what she's used to ! 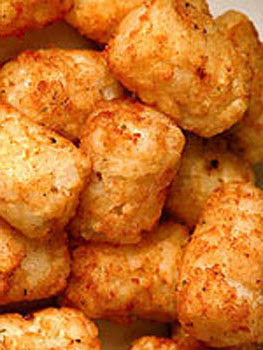 I have heard of Tater Tots ... am off to Google them ... they look yummy !